BEFORE: You may have noticed I took another day off tomorrow. I know, major slacking going on. It’s all that work that’s required at a thing called college. I actually did watch the scheduled Tarnation as it was shown in my Media Criticism class but I did not like it one bit and could not bring myself to write a review, on top of all the other work I had. So short review right now; don’t watch it. There you go, I just saved us both a lot of time. But onto more important matters is a film I’m actually going to write about, Bull Durham. After beginning the baseball chain at the start of the Division Series in early October, I’m now resuming it. Hopefully Bull Durham brings some excitement from the fantastic real games that have been played this postseason because the earlier films were lacking a bit in that department. But I’ve talked way too much. Batter up! AFTER: Bull Durham has had the most focus on the actual mechanics of baseball out of all the other films I’ve seen in the marathon. It also has a fairly big secondary plot (or main plot depending on how you look at it) and that is the love triangle between “Crash” Davis (Kevin Costner), “Nuke” LaLoosh (Tim Robbins), and Annie Savoy (Susan Sarandon). I was really looking forward to a lot of actual baseball in this chain and until Bull Durham was very underwhelmed. While there are more important things in any film, like a good story (in this case the love-triangle), but my main draw is the baseball. To me a baseball film should put the focus solely on the games, practices, etc. and then have a intriguing secondary story to tie everything together and give a sense of purpose for watching the film instead of a real-life game. 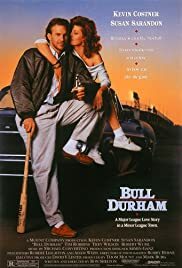 Bull Durham accomplished more in this regard than the previous four movies in this chain, but it still falls a bit short from a perfect balance between America’s pastime and a meaningful story. While Bull Durham wasn’t the home-run I’ve been looking for with these baseball films, it was at least an RBI double that tied the game in the bottom of the ninth inning. It’s up to Field of Dreams tomorrow to try and win the title of best baseball film by having a great balance between baseball and story, something Bull Durham almost nailed, but was off by just a fraction of an inch.